Worldly Wisdom from Everyday Goddesses! Ask yourself— what would be the effect in the world of all our daughters being introduced to the concepts of honoring their own wisdom, power and intuition? * The women you will meet in this deck are everyday Goddesses like yourself. They are your friends, neighbors, sisters; your wives, lovers, daughters, teachers, etc. These inspired and inspiring women look to support each other, and all of us, toward honoring the personal power and intuition within each of us, on the way to achieving all of our dreams and goals and bettering our world. Each is a modern Muse sharing the gifts of her wisdom, knowledge, experiences and heart truth. * This first series comes by way of those who have attended my first two annual Moon Goddess retreats. * Future installments shall be released as we accumulate each new batch of 24 goddesses. This tool is intended to grow in scope and power as more and more women become willing to acknowledge and share their gifts. And-- a growing number of groups are beginning to schedule their own Oracle design workshops. 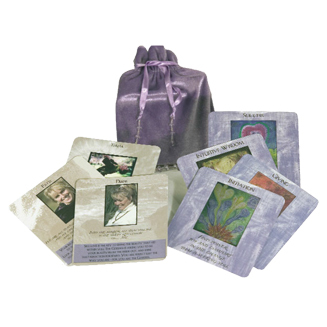 * Each card features an original piece of artwork, a personally selected theme and intuited message for the person drawing that card, along with a portrait of each “goddess”. The work of each participant is detailed in the accompanying booklet so that the creative or healing endeavors of these women may be supported. And a portion of sales continues to feed back into other worthy projects and a scholarship/tithe fund to help others who might otherwise not be able to attend one of my classes. We truly are women empowering women and artists supporting artists! * provides a complement of effective tools from which to achieve this.